Washington (CNN) – In a stadium filled with 8,000 evangelical Christian women, one person near the stage stands out. Sporting short salt-and-peppered hair, broad shoulders and a high-collared shirt, the man sits calmly as ballerinas flutter across the stage, women tell jokes about menopause and the event’s emcee announces that almost all the men’s rooms at the Verizon Center in downtown Washington have been converted to female restrooms for the night, provoking a round of applause. For Kurt Warner, former quarterback for the St. Louis Rams and Arizona Cardinals and two-time National Football League MVP, this is about as far away from the testosterone-driven world of the gridiron as you can get. Onstage is the reason Warner’s here: Brenda Warner, her angular face and close-cropped blonde hair radiating in professional lighting, telling the audience about God’s plan for her life. For years, Brenda was known as Kurt’s uber-supportive wife – a woman whose unflinchingly defense and championing of her superstar husband sometimes made news in it its own right. Today, two years into Kurt’s retirement, those roles are changing. Brenda has become what some call "Christian famous" - a renowned evangelical speaker who tours the country with the likes of the 2012 Women of Faith tour, which will reach tens of thousands of Christian women with a message of hope and faith. As one of the tour’s headliners, Brenda will travel the country each weekend until November to tell her story – one of heartbreak, love and growth. Through much of it, Kurt will be there with her, sitting in the audience as his wife does her thing before throngs of adoring fans. Brenda Warner’s story is a tear-jerker, whether or not you accept the God part. When she was 18, she joined the Marine Corps, a job that took her from her hometown of Parkersburg, Iowa, to bases in Japan and in Virginia Beach, Virginia – where she would marry another Marine and give birth to a baby boy. When Brenda begins to explain her life to the crowd in Washington, women applaud for the lines about joining the Marines and having baby Zachary. Then the story takes a dark turn. While working one day in Virginia Beach, Brenda got a phone call that changed her life. Her husband had dropped Zachary on his head, an accident that would leave their toddler legally blind and developmentally disabled. Speaking in Washington, Brenda recounts the scene at the hospital. A hush has fallen over the stadium. Women wipe tears from their cheeks; one has pulled her pink T-shirt over her eyes. Brenda became a registered nurse, largely to learn how to better cope with Zachary’s condition. To make ends meet, she stood in line for food stamps and moved out of her parent’s basement and into low-income housing. One night in 1996, Brenda’s sister called to report that their mother and father, who had retired to a cabin in Arkansas, had been killed in a tornado. Their house had been wiped off the map. “They were always my soft place to fall,” Brenda tells the crowd. At this point, the woman with her head in her T-shirt is a sobbing headless body. But as quickly as she has just dropped the mood, Brenda builds it up by telling the women that God brought her through it all. “I married that football player,” she says, gesturing toward Kurt. “He adopted my two and we have five more.” Tears are giving way to applause. Kurt and Brenda Warner first met when Kurt was playing college football at University of Northern Iowa. Near the end of the speech, Brenda brings Zachary out to say hello to the crowd. Afterward, many women say they saw themselves in Brenda’s story. “She is just a normal everyday mom raising a family just like everybody,” says Sena Hohman, her two daughters accompanying her to the event. “Hearing these stories, you find out she is just like me, with ups and downs in life, with peaks and valleys. When she’s offstage, Brenda and Kurt often operate as a team in their faith-based work. On the recent Friday morning before Brenda addresses the Women of Faith conference, the couple find themselves in a small, bland conference room in downtown Washington. Kurt takes notes while Brenda’s eyes stay fixed on the architect who’s briefing them. The topic: plans for a multi-apartment home for developmentally disabled young adults that the Warners want to build in their hometown of Scottsdale, Arizona. The project is inspired by Zachary, now a 23-year-old high school graduate. “Zach has probably impacted more people than all of us combined because there is something unique and special and honest about these individuals that see it like it is and call it like they see it,” Kurt says. Zachary lives in a group house in St. Louis. The Warners are modeling the group home they’re building in Arizona, called Treasure House, on the St. Louis Life concept for independent living for those with special needs. At the meeting in Washington, Kurt is very much in control, with the architect and a consultant urge the Warners to use Kurt’s celebrity to help raise funds. “Leverage your history,” the consultant says, looking at Kurt and talking football. Kurt’s story, like Brenda’s, includes some letdowns. After going unselected in the 1994 NFL draft as a quarterback out of University of Northern Iowa, Kurt became a Hy-Vee grocery store stock clerk to make money. While stocking shelves, he signed with the Iowa Barnstorms, an Arena Football League team in Des Moines, Iowa. With his big arm and accuracy, he became an AFL star. After a short stint with NFL Europe, Kurt became the third -tring quarterback for the St. Louis Rams for the 1998 season. In 1999, after an injury to the Rams’ starting quarterback, he got his chance. Leading the Rams to a Super Bowl XXXIV victory, Kurt won both the league and Super Bowl MVP award that year. 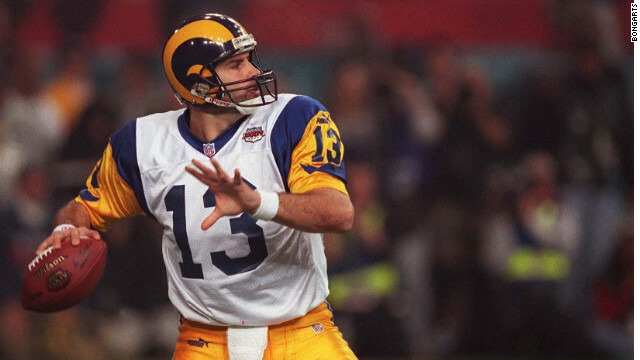 Kurt Warner drops back to pass in Super Bowl XXXIV, a game his St. Louis Rams defeated the Tennessee Titans, 23-16. Brenda was there through all of it, from AFL to NFL. She and Kurt met while Kurt was attending college in Cedar Falls, Iowa, at a country bar where she was taking line dancing classes. She worried he wouldn’t be able to handle the fact she was divorced with two kids. When Kurt led the Rams to their 1999 Super Bowl victory, not only was Brenda there - she became part of the story. Brenda was vocally defensive of her husband when he had a bad game, even calling into radio stations to criticize the Rams coaching staff. That zeal and her on-camera postgame kisses for the star quarterback had some fans calling her the Yoko Ono of football. The interview provided a name for Kurt’s foundation, First Things First, which is “dedicated to impacting lives by promoting Christian values, sharing experiences and providing opportunities.” The group raises money, taking advantage of Kurt’s NFL connections, and organizes events for ill and developmentally disabled children. Today, Kurt spends much of his time on such work. It’s why he’s talking building schematics instead of defensive schemes. But talking about civil engineering in a drab hotel conference room is a long way from the National Football League. The common thread: Brenda and their religious faith. Kurt says he had wanted Brenda to pursue her speaking career for years. But while he rose to superstardom, Brenda was a stay-at-home mom. Now that Kurt is home more, he says, Brenda is free to pursue her dreams. Brenda and Kurt now work closely together planning the couple's newest philanthropic venture – Treasure House. Armed with her story and the star power that comes with her last name, Brenda has carved her own path on the Christian speaking circuit. Asked about the Warners at the Verizon Center’s Women of Faith event, only a few of the attendees know about her famous husband. The tour is marketed to evangelical women to “celebrate what matters,” and also features appearances by female evangelical authors and media personalities. The tour is like a conference, with sessions on different challenges women face. Telling her story has become second nature for Brenda. She has become expert in pitching God as the cure to heartache. And neither, it seems, will Kurt. Can I just say what a relief to seek out somebody who truly is aware of what theyre speaking about on the internet. You definitely know how one can bring a problem to gentle and make it important. More people have to read this and perceive this aspect of the story. I cant believe youre not more well-liked since you definitely have the gift. Thank you Warners for sharing your faith and your work for the furtherance of Gods Kingdom! You are a sweet family and I hope God continues to bless your lives and those around you. on the comment to your past, I think it takes somoene brave to share a story so publicly. Domestic Violence is something that happens to so many people and I am thankful that you took the opportunity to bring awareness. You are one strong woman!! hypothyroid? I think this poster means cretin. I wonder if there's some sort of translation software involved. hypothyroid? I think this poster means cretin. I wanna sit on Kurt Warner's face.